Perfect for mounting smartphone, GPS or MP3 player to your car's windshield. Works with iPhone and iPod. It has adjustable holder that rotates 360 degrees and flexible goose-neck with locking suction cup. Fits devices between 4.5 to 9.5cm. 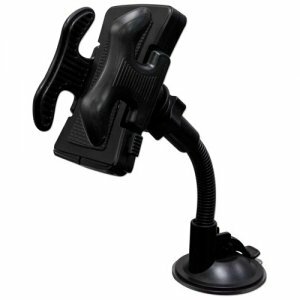 This kit includes (1) Windshield Mount Holder and (1) 1meter USB to dock sync & charge 3-in-1 cable. Its 30-Pin port charge and/or sync iPod/iPhone/iPad while Mini-B & Micro-B port sync/charge tablets, smartphones, digital cameras, MP3 players, and GPS.